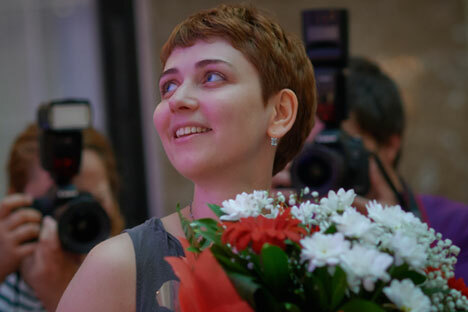 Anna Starobinets, winner in the 2014 National Bestseller – Beginning nomination, during the 2014 National Bestseller literary award ceremony in St. Petersburg's Astoria Hotel. Russian literature has a well-known classic canon, but who are the young writers driving it forward today? If Russian literature has a face, it is perhaps Leo Tolstoy in his later years: bearded and austere. However, there is a long tradition of vibrant young writers pushing the boundaries of the country’s prose and poetry. Alexander Pushkin was well-established in the literary imagination by the age of 24, Lermontov was 23 when he was acclaimed as the “new Pushkin”, Dostoevsky gained recognition for his first novel at 25, Kharms, Mayakovsky and Akhmatova were all pursuing groundbreaking work in their early 20s. The 21st century has seen the rise of successors to these famous names who are carving out their own niches in domestic and world literature. There is no such categorization today, and Ksenia Buksha, Sergey Shargunov, Anna Starobinets and Alisa Ganieva are all “young” in the typical sense and achieved success before turning 30. Zakhar Prilepin published his first novel at 30, but this might have come earlier had he not been sent to fight in Chechnya and then had to work hard to support his family. Now 40, Prilepin is firmly established as one of Russia’s contemporary classic writers, and has published his collected works. Prilepin himself represents another way that modern Russia differs from the Soviet Union in the opportunities it offers for young writers: a lessening of Moscow’s dominance. The country is still very centralized, with about 90% of artistic and literary events taking place in Moscow or St. Petersburg, but this is changing slowly. The Krasnoyarsk Book Fair has been running for almost a decade, and there is no longer an expectation that you have to move to Moscow to make it in the creative world. Prilepin himself attended Nizhny Novgorod State University and now lives in a remote village on the Volga. The Soviet period was also dominated by the Writers’ Union, which was the only route that authors could take to get their works published in literary magazines. Although this might have brought a certain amount of official recognition, it also generally meant compromising your ideals, as the publications were run by editors with certain well-established aesthetic and ideological preconceptions. In modern Russia, young authors can found their own literary magazines. The writers Katya Morozova and critic Igor Gulin (both under 30) did just that, establishing their own print magazine, Nosorog (rhinoceros). Contemporary young writers also have various grants, foundations and programs to choose from – to say nothing about the Debut Prize, which is awarded to writers under 35. Young Russian writers have responded to the new opportunities and freedoms of the post-Soviet period to produce highly diverse subject matter, catering to every reader’s taste. There is Guzel Yakhina's Zuleikha Opens her Eyes, which is a personal family story based on the experiences of her grandmother, who was exiled from a village in Tatarstan to Siberia. Fans of the more mystical will appreciate Anna Starobinets’s Asylum 3/9, while Dmitry Glukhovsky's Metro 2033 stands out as an example of a post-apocalyptic epic. Zakhar Prilepin and Sergey Shargunov are great exponents of the political novel, writing from an oppositional standpoint, which certainly contributed to their fame and notoriety within Russia. They may not have the thousand-yard stares and beards of old, but the new contingent of young Russian writers are making sure that the country has a literary future as bright as its past.